Please help us improve 511PA by completing the online feedback form. 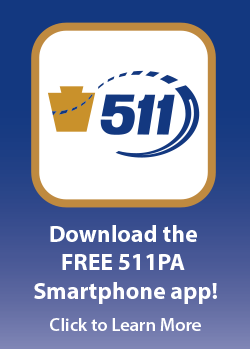 Regional traffic advisories for roadways not on the 511PA roadway network. To report roadway concerns on state-owned roads such as pothole locations, storm water and drainage concerns, traffic-related concerns, or damage to personal property, visit our Customer Care Center website. Additionally, you can report potholes by calling 1-800-FIX-ROAD. Users can access contact information for each PennDOT District Office through the PennDOT District Map.